August Franzen is a contributor to Writers on the Range, the opinion service of High Country News. He is an intern with the National Park Service in Seattle. People look confused when I tell them I’m interning for the National Park Service in downtown Seattle. “But you’re in the middle of the city,” they say. Yes, but while my work is on a noisy street instead of in quiet woods, I’m still in a park, the Klondike Gold Rush National Historical Park, on a crowded block in the city’s oldest neighborhood. As part of the agency’s In My Backyard program, I’m supposed to do community outreach, and my job brought me to a street fair called Dragon Fest in Seattle’s Chinatown-International District. How do you create an instant national park? You can’t, but a “mobile park” team did its best, turning part of a Seattle sidewalk into a green area complete with ferns, plastic animals, stickers, a photo wall and an owl puppet that made children laugh when I flapped its wings and whistled, “Whooo, whooo.” While the kids played, adults pored over our interactive map of all 417 park units, and I heard many fond memories of road trips to parks and helped plan some future ones as well. But for every person who told stories of hiking through Zion or Yellowstone or Glacier, there was someone who ignored me or lost interest when I told them my owl puppet wasn’t for sale. It was easy for me to talk to people who were familiar with national parks, but it was difficult to make the others even care. How could I explain what national parks were and why they mattered? Every description seemed inadequate in some way. “They are giant open spaces that everyone can camp and hike in.” True, but it doesn’t capture the importance of the many parks that preserve history and culture. “Parks are special natural and cultural places that are preserved for everyone to visit.” Also true, but uselessly vague. 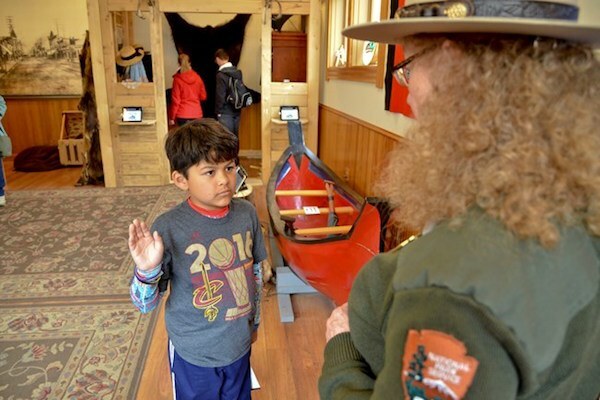 A boy gets sworn in to the Junior Rangers at the Klondike Gold Rush National Historic Park in Alaska. Why was I having trouble explaining what a national park was when I’ve spent my whole life in them? Maybe it was for exactly that reason. My parents took me to the backcountry when I was 18 months old — thanks, Mom, for packing out those dirty diapers — so there’s never been a time when I wasn’t familiar with our public lands. Because I saw Old Faithful when I was 7, it was hard talking to 7-year-olds who hadn’t. I’ve been hiking in the mountains so often that I had a hard time explaining why Mount Rainier National Park exists. Over the past few months, I’ve realized these barriers exist throughout the National Park Service. The agency has gotten so used to its own existence that it has a hard time connecting with new audiences. The parks have worked so hard to appeal to people who look like me — white, male and comfortable in hiking boots — that they have trouble going any further. People who know the parks will visit them, and people who don’t, won’t. These are the challenges that my internship was created to address, and the challenges that motivated me to join. Just as the National Park Service needs to get outside of its walls and fences, I needed to work outside of my own experiences. So there I was, standing there at Dragon Fest talking to visitors, still trying to figure out how to reach people. I asked myself: Why do I love the national parks so much? My own answer is wrapped in so many memories. It’s stitched into the scarf I wore skiing in Yellowstone National Park and laced up in the boots I wore on the trails of Bandelier National Monument. But ultimately, I go to national parks because I can see things there that are beautiful and rare — things that I can’t see anywhere else. I let this guide me. I hope he’ll remember that invitation, and fall in love with national parks the way I did.